This image jumped out at me while I was looking for something else. Oh yes, I remember that day, standing on one of Ghent's small bridges. Down the River Leie came the man in the kayak, sliding so quietly through the water. I was admiring the way the reflections of the boats shimmered as he passed. 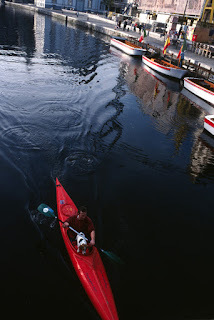 Then I noticed the dog, so intent on the water just beyond the prow of the kayak. Perhaps this one should be titled "Dog Is My Co-Pilot."